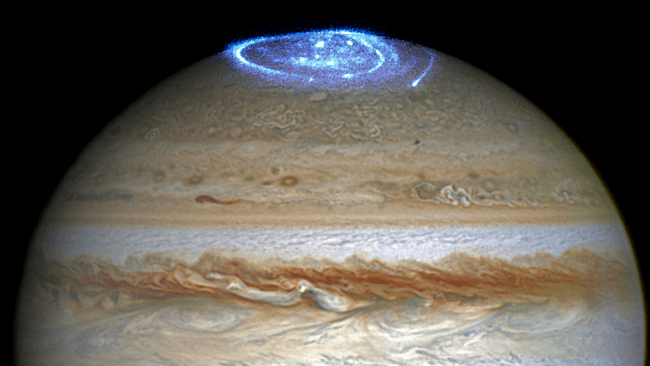 Astronomers are using NASA’s Hubble Space Telescope to study auroras — stunning light shows in a planet’s atmosphere — on the poles of the largest planet in the solar system, Jupiter. This observation program is supported by measurements made by NASA’s Juno spacecraft, currently on its way to Jupiter. Jupiter, the largest planet in the solar system, is best known for its colorful storms, the most famous being the Great Red Spot. Now astronomers have focused on another beautiful feature of the planet, using the ultraviolet capabilities of NASA’s Hubble Space Telescope. This observation program is perfectly timed as NASA’s Juno spacecraft is currently in the solar wind near Jupiter and will enter the orbit of the planet in early July 2016. While Hubble is observing and measuring the auroras on Jupiter, Juno is measuring the properties of the solar wind itself — a perfect collaboration between a telescope and a space probe. The new observations and measurements made with Hubble and Juno will help to better understand how the sun and other sources influence auroras. While the observations with Hubble are still ongoing and the analysis of the data will take several more months, the first images and videos are already available and show the auroras on Jupiter’s north pole in their full beauty. In support of the Juno mission, Hubble will continue to monitor Jupiter auroras several times a month for the duration of the Juno mission. The Jet Propulsion Laboratory (JPL) in Pasadena, California, manages the Juno mission for the Southwest Research Institute in San Antonio, Texas. Juno is part of NASA’s New Frontiers Program, which is managed at NASA’s Marshall Space Flight Center in Huntsville, Alabama, for NASA’s Science Mission Directorate in Washington, D.C. Lockheed Martin Space Systems, Denver, built the spacecraft. The California Institute of Technology in Pasadena manages JPL for NASA.